The unspeakable events of September 11, 2001, changed the flavor of certain words. The concepts of revenge and vengeance suddenly became more palatable, while the opposite happened to words like healing and reconciliation. Suspicion is no longer an unworthy sentiment and hardness no more an unpleasant quality. The immensity of this tragedy has given to September 11 a unique place in the annals of callousness. 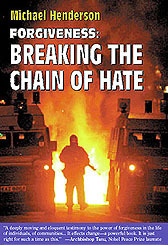 In these altered circumstances, Michael Henderson offers this new edition of Forgiveness: Breaking the Chain of Hate as evidence that the stuff of forgiveness is sterner than suspected. It does not condone evil, and evil, on its part, cannot extinguish the power of forgiveness. Who are the ideal addressees for the message of forgiveness? Americans wounded and enraged by September 11? Afghans witnessing the flattening of that remained of their nation's structures? Palestinians enraged by a denial of statehood? Israelis threatened by neighbors? Arabs asked to continually postpone their hopes? Even when our indignation appears to us wholly justified, most of us, whether Arabs, Jews, Americans, Afghans, Indians, Pakistanis, Kashmiri Muslims, Kashmiri Pandits or whomever, are also aware that personal bitterness can be like acid that corrodes us from within without damaging those whom we are bitter toward. Most of us, therefore, are in favor of some forgiveness somewhere. We might even start to feel something of an enemy's ache, or to see ourselves in the enemy, and the words 'ours' and 'theirs' might begin to acquire new flavors. If that is so, we will find medicine in these pages, sensitively dispensed. If we are more fortunate still, we may find ourselves drawn to some of the real people of whom he is writing. We might even start to feel something of our enemy's pain. The relationship between strategies for reconciliation and nonviolence calls for reflection. Under the leadership of my grandfather, Mahatma Gandhi, and largely using nonviolent means, India won her independence from British rule. But, nonviolence did not lead to Hindu-Muslim reconciliation. In violence involving Hindus, Sikhs and Muslims, around half a million were killed on the subcontinent. Two days before the terror of September 11, I was in Pakistan's Frontier province in the town of Charsadda, close to the Afghan Border. I was meeting two grandsons of the late Khan Abdul Ghaffar Khan. Khan died in 1988 at the age of ninety-eight, after an unceasing nonviolent struggle for independence and for the rights of his Pakhtun people, who live both in Pakistan and Afghanistan. Rallying to the leadership of Ghaffar Khan, many Pakhtuns adhered for decades to nonviolence, invoking their religion, Islam, for the purpose. Yet, the violence surrounding them in 2001 was a fact, as was the proximity of religious fanaticism. Divisions between the Pakhtuns on the one hand and the other ethnic groups inhabiting Pakistan and Afghanistan were another reality. The subcontinent's story and that of Afghanistan show that nonviolent strategies cannot ensure goodwill and reconciliation, and that great anger can at times accompany nonviolent campaigns for rights. Forgiveness and reconciliation may thus be more crucial to our future than nonviolence. Again, forgiveness might be consistent with a restrained and responsible use of force in self-defense. During the 1946-1947 Hindu-Muslim violence, Gandhi explicitly permitted force in self-defense. What he said was impermissible was violence against innocents and violence out of ill will. All the same, violence may have been discredited by the September 11 attacks. It seems harder now to advocate violence for a "just cause." Once encouraged, violence runs to horrifying excess, and the "just cause" suffers. On the other hand, nonviolent strategies are easier to control; they do not enrage the world; they might aid a cause. But I should return to the terrorist attacks and to one of the dozens of imperishable American images bequeathed by it; young Manu Dhingra saying to the USA after being burned almost to death, trudging down eighty floors and finding arms that would carry him and doctors who would heal him: "I don't know why I have been given my life back. But I know that I don't want any innocent person in Afghanistan or anywhere else to die." For more than two centuries, America has been conducting an unparalleled experiment. To millions entering its shores, from a variety of races and religions, it has offered liberty, dignity, and opportunity. But today it is also the world's leader, peerless and unchallenged. Conducting a great continental experiment and leading the world as a whole, i.e., caring for all the earth's peoples, are two different enterprises, a truth that Americans may need to grasp. The former demands a focus on America's security, the latter on the hopes and hungers of everyone on earth. Yet let me say if the utterance is appropriate from a frequent visitor to the USA who has learned to love its people and who has been moved by them that both enterprises can only be aided by the stories of forgiveness and reconciliation skillfully garnered here. An Englishman who made the USA his home for 20 years and who has befriended men and women of numerous lands, Michael has used in this book his gift for spotting individuals during their nobler moments, when their souls are enlarged, the big I is ignored, and they seem willing to offer or accept forgiveness. On behalf of the many around the world encouraged by his writings, I thank Michael and wish his pen continuing power.